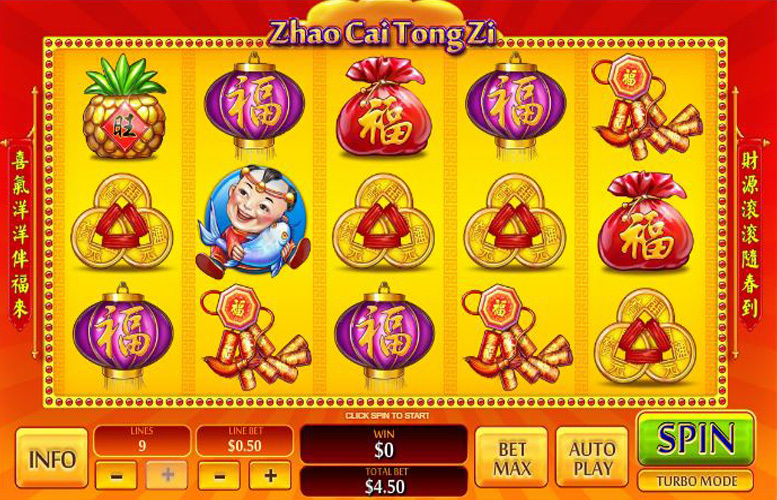 The Zhao Cai Tong Zi slot is like a super-charged version of the similarly titled Zhao Cai Jin Bao machine from Playtech. In terms of gameplay, it’s very similar. The only major difference, aside from artwork, is the fact that Zhao Cai Tong Zi has almost double the top prize! This one is pretty much “the daddy” of the top-heavy Chinese themed machines we’ve featured. If you were to hit five-of-a-kind using a “wild”, the prize could be lifechanging. Tasteful art style that captures an atmosphere of traditional China well. The symbols are beautifully illustrated and this gives the title the feel of a quality machine. Incredibly top-heavy machine. The whole pay table is loaded with amazing cash prizes. This is somewhat of a trend on Eastern-themed machines, many of which seem to prefer massive prizes and few features. Massive return-to-player rating. That should be incentive enough to give it a go. Very limited gameplay features. As mentioned, it’s all about that massive pay table. However, these days most gamers enjoy a few side games, and interactive bonus features. Boy with gold = 10,000x the line bet. Girl with gold = 5,000x the line bet. Boy with fish = 1,200x the line bet. Girl with flower = 750x the line bet. The Zhao Cai Ton Zi slot machine is limited in its feature departments. There are no free spin rounds, and no other additional bonus stages in their place. Whilst this is unfortunate, it does offer “wild” double-ups. When combined with the already top-heavy pay-out structure, this can make for some massive wins. All symbols pay left to right and right to left on Zhao Cai Ton Zi. 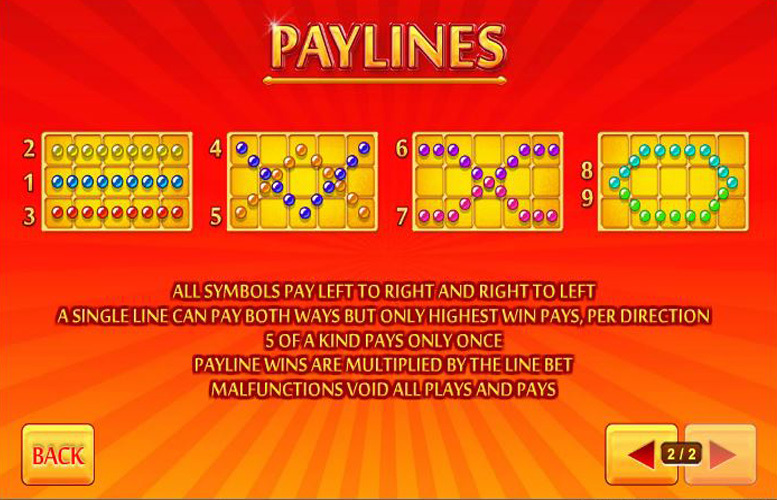 There’s a total of nine pairs of lines, and players should note that any five-of-a-kinds will only pay in one direction! The traditional dragon face illustration is the game’s “wild” symbol. It only appears on reels two, three, and four, and substitutes for all symbols. The best thing about the “wilds” on Zhao Cai Tong Zi is that all wins that feature one as part of the winning combination are doubled. Doesn’t sound too impressive, until you look at the whole pay table that is. Pineapple = 350x the line bet. Red sack = 250x the line bet. Coins, or tablets = 200x the line bet. Purple lantern, or fireworks = 50x the line bet. 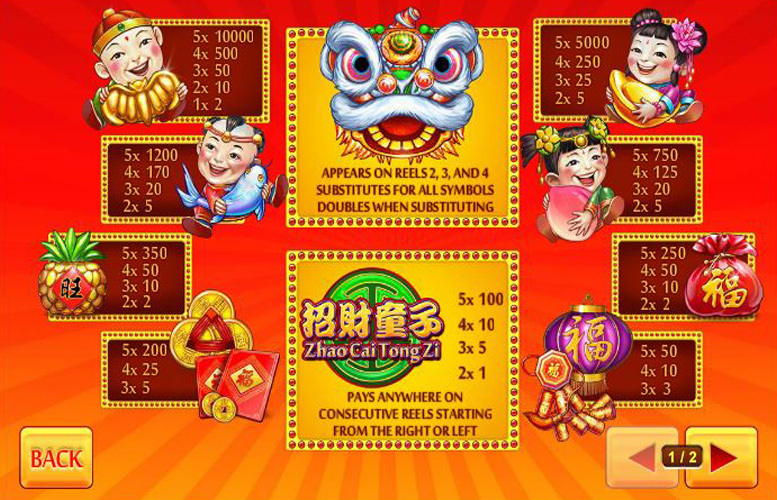 Players can adjust the amount bet per win line and the number of win lines they wager upon on Zhao Cai Tong Zi. As the win lines are divided into nine pairs, the maximum is nine and the minimum is just one. Meanwhile, the lowest bet possible per line is 1p, and the highest is £100. This makes the lowest possible bet per spin just 1p, and the highest a sizeable £900. We really like this machine. Once you get over the fact that there aren’t many special features, and that it’s not about side games and bonus rounds, the game comes into its own. For a start, it has an RTP of over 97%, which is fantastic. Then there’s the potential maximum win of 20,000x the win line bet. Such pay outs are substantial even when betting the minimum possible. It’s certainly not going to be a title that appeals to every punter out there. Some people just love extra bonus rounds too much. However, if you’re the sort who wants to wager on an incredibly fair game with chances to win some huge bonuses, and don’t mind just watching reels spins, then Zhai Cai Tong Zi might be your ideal machine. This game has a rating of 5 / 5 with 392 total reviews by the users.